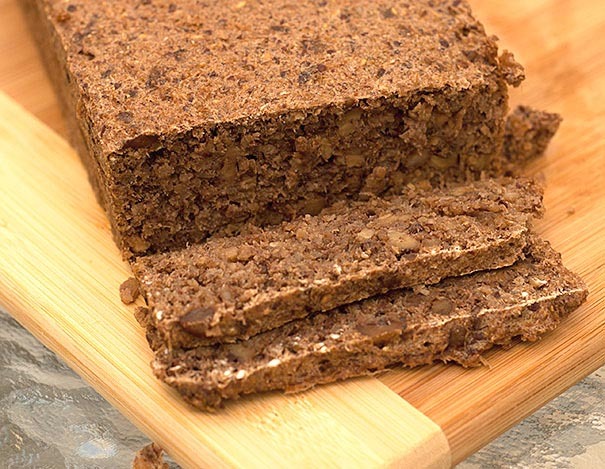 This ancient bread is perfect for the health conscious person in your family. This bread takes 3 days to make - the wheat berries (kernels) must first be sprouted. Add the wheat and rye to a large bowl and pour in enough filtered water to rise a few inches over the grain. Stir to ensure all the grain is wet. Leave for 12 hours. After 12 hours, drain the grain and rinse with filtered water and rinse twice a day until the grain has sprouted. (tails as long as the grain) This can be as quick as 2 or as long as 3 days depending upon the room temperature. When grain has sprouted, grind it in a meat grinder, food processor, Vitamix or Thermomix along with ⅓ cup of chopped dates. Grind until the mixture looks like bread dough - it will. I needed to add a tablespoon or two of filtered water to get the right consistency. Add the remaining dates and nuts, mix well and leave for at least one hour, no more than 2. Pour into a greased bread tin and bake in the oven for 3 hours. Turn off oven and leave until oven is cold. I made mine at night and left it in the oven all night and ate it for breakfast. Keep in the refrigerator if you're not going to eat it all in a day or so as there are no preservatives.